WASHINGTON -- The National Highway Traffic Safety Administration has opened a probe into potential unintended braking in 675,000 2017-2018 Nissan Motor Co. Rogue crossovers, the agency said in a statement on Friday. The investigation follows reports that the automatic emergency braking system can engage without an apparent obstruction in the vehicle’s path. In March, the Center for Auto Safety petitioned for a NHTSA investigation, saying there had been at least 87 consumer complaints. "Nissan has attempted to address the defect as a service matter rather than a safety problem," the center said. There are no reports of injuries or deaths associated with the petition. 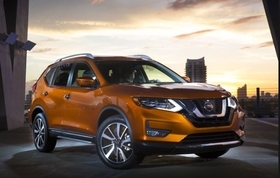 Nissan said it had investigated the issue extensively and after talks with NHTSA, as well as its Canadian counterpart, Transport Canada, it had notified all affected Rogue vehicle customers in the United States and Canada of a software update. “As always, Nissan will continue to work collaboratively with NHTSA and Transport Canada on all matters of product safety,” Nissan said in a statement. Nissan faces a class-action lawsuit over unintended braking issues in U.S. District Court in California covering Nissan and Infiniti vehicles sold since 2015. The suit says a defect can trigger the brakes and cause vehicles "to abruptly slow down or come to a complete stop in the middle of traffic."